So we are back with yet another detailed car review and this time around we have got something special for you all. The car in question is Toyota Vitz. 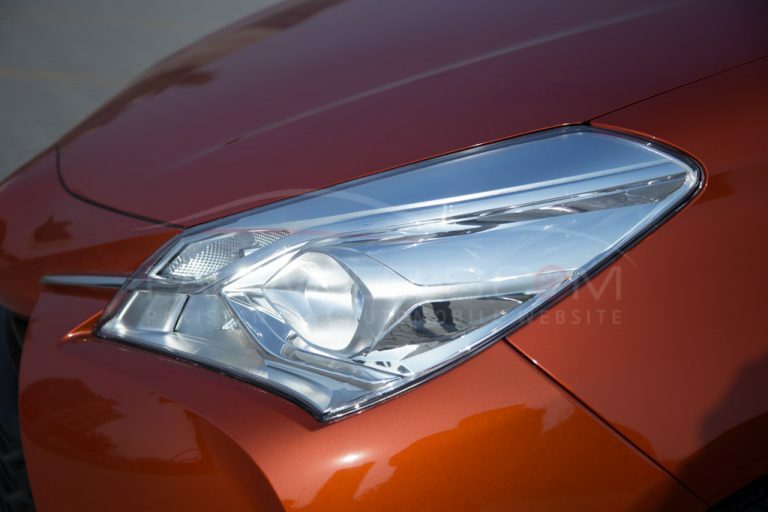 But it is no ordinary Vitz; we are talking about the 2017 Toyota Vitz Hybrid. And it is the first hybrid Vitz in Pakistan. But before we start talking about this particular car in details, let’s take a brief look at Toyota Vitz and its evolution. Vitz is a subcompact hatchback manufactured and sold by the Japanese automaker Toyota. Vitz comes in both 3- and 5-door variants. Toyota started producing Vitz back in 1998. Vitz is one of the most successful small cars by the Toyota. Up until now, there have been three generations of the car. 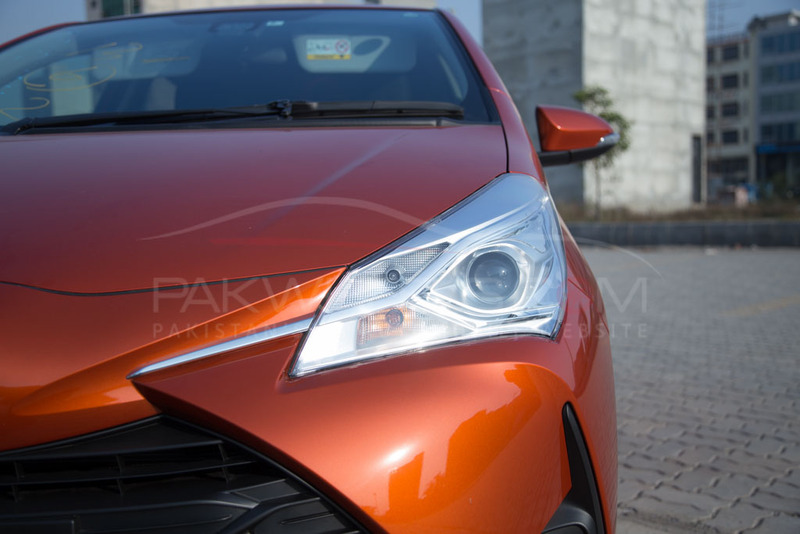 It is sold under Yaris nameplate in many parts of the world. Currently, as mentioned above, Toyota Vitz is in its third iteration. The first generation (XP10) lasted from 1998 to 2005. The second generation (XP90) was launched in 2005 and later discontinued in 2010. And this third generation (XP130) was introduced in 2010 and is still in production. The third generation received a couple of facelifts (2014 and 2017). The Toyota Vitz hybrid we reviewed, as mentioned above, is the 2017 model; the second facelift of 3rd gen XP130 Vitz. 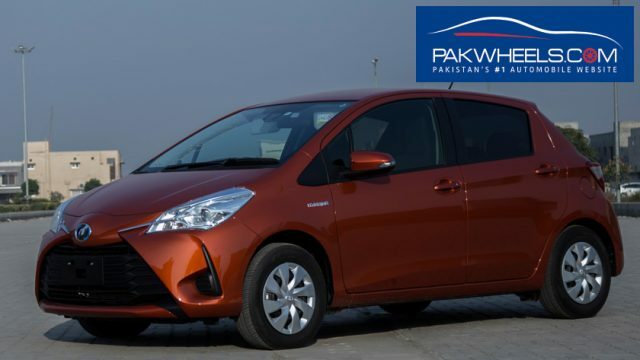 Depending on the market and year of production, Toyota Vitz has been sold in a bunch of variants with all sorts of drivetrain, and platform options. This particular 2017 Toyota Vitz hybrid we had is a 5-door base model F variant and was only 300 km driven. Let’s talk about body dimensions first. 2017 Vitz hybrid is 3945mm long, 1695mm wide and 1500mm tall. 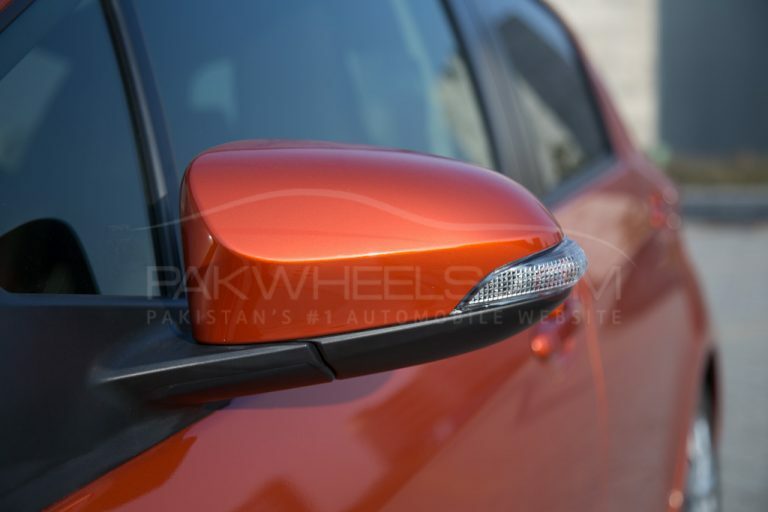 To give you a perspective, the new Suzuki Cultus is 3600x1600x1540mm. And the Pak Suzuki Swift is 3755 x 1690 x 1525mm. You can see that this Vitz is longer, wider and taller than the new Cultus, and longer and taller than the local Swift. The wheelbase of 2017 Toyota Vitz hybrid is 2510mm. That is more than both the new Cultus (2425mm) as well the Swift (2390mm). 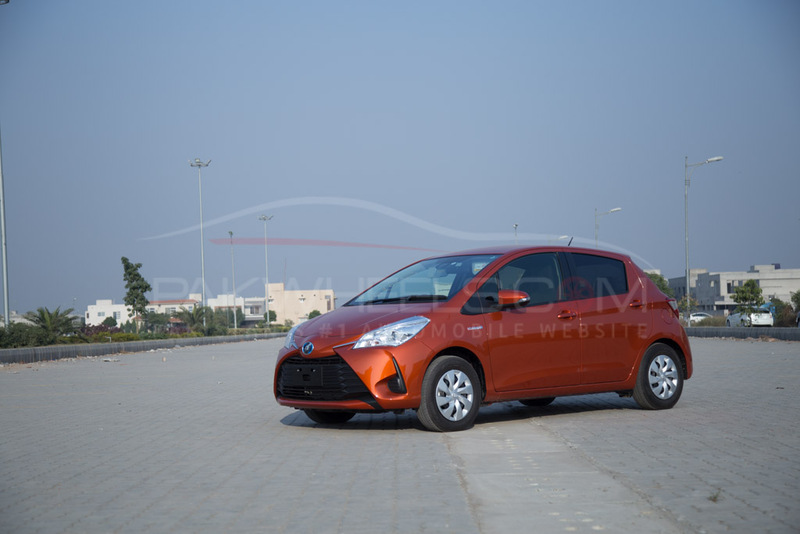 Where the second generation Vitz looked altogether different from the first gen Vitz with its bubble-like exterior, the third-gen Vitz looks much more conventional and related to the first gen Vitz. But like all other carmakers, Toyota has also started to stick with a similar design language for all their vehicle lineup for a particular set of years. 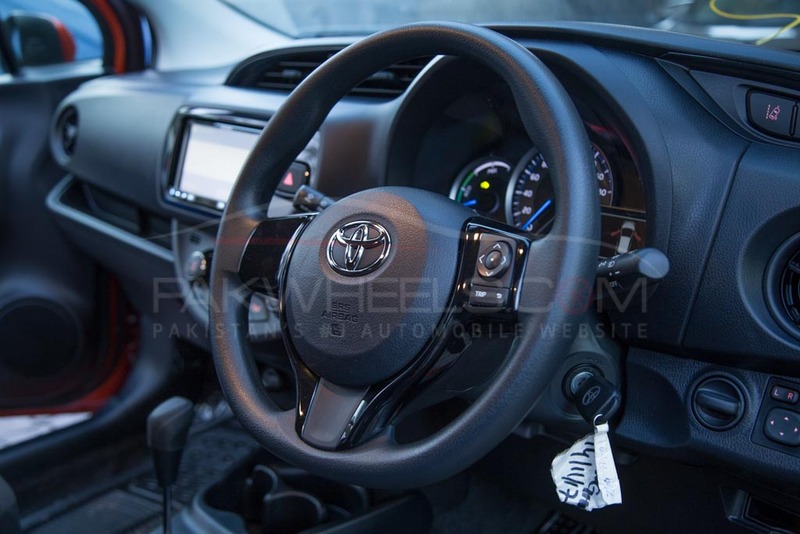 Looking at this Toyota Vitz hybrid, you can easily place it among other 2017 models of Toyota. As I have said before, the third generation Vitz looks related to the first gen Vitz. 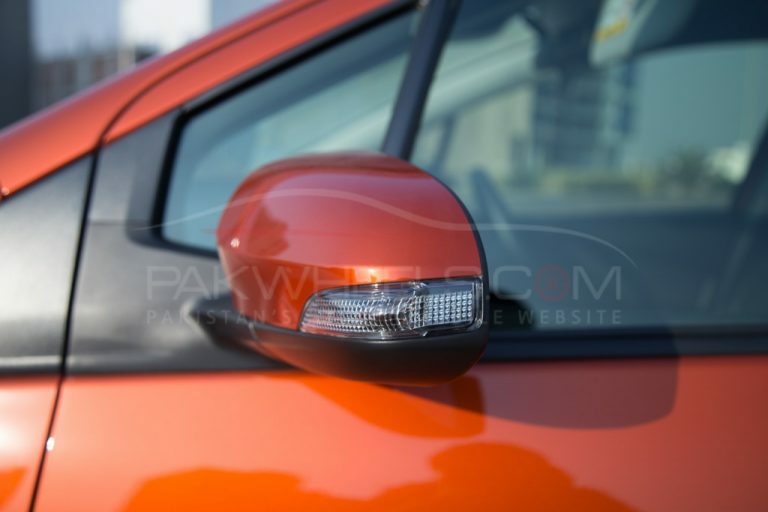 The first generation Vitz had rounders, and softer edges and curves, the first iteration of third-generation hatchback had kind of similar design, but the edges and corners were a bit sharper and defined. 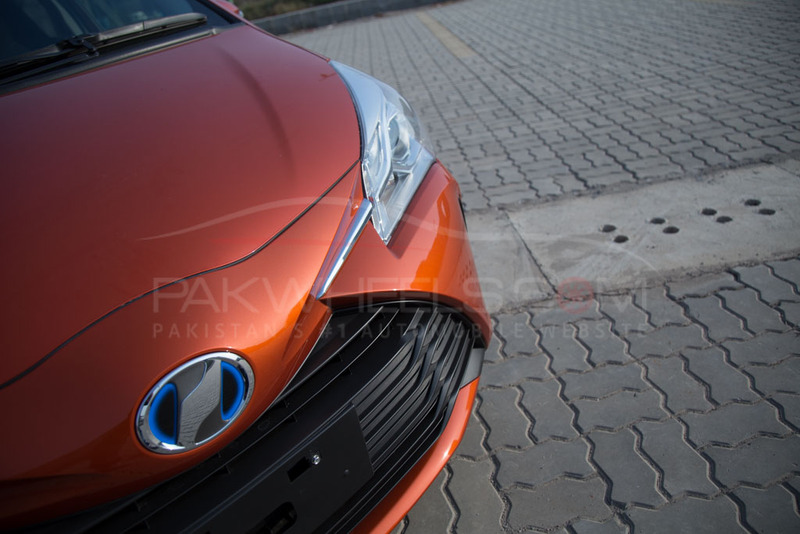 With the first iteration facelift of the third generation, Toyota introduced a massive front grill in the front bumper. The newly introduced front bumper has quite a complex design where I can imagine it getting dirty quite easily and becoming hard to clean afterward. 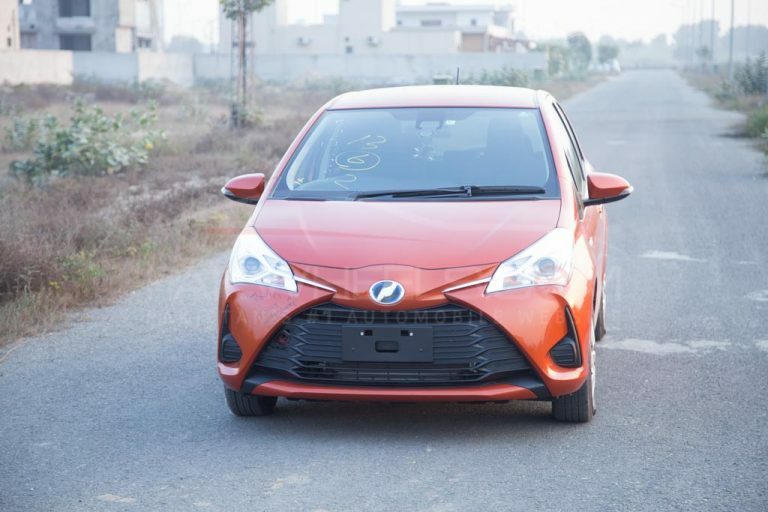 And with the 2017 facelift of Toyota Vitz, Toyota kept the same massive grill but made the edges and cuts more sharper than before. 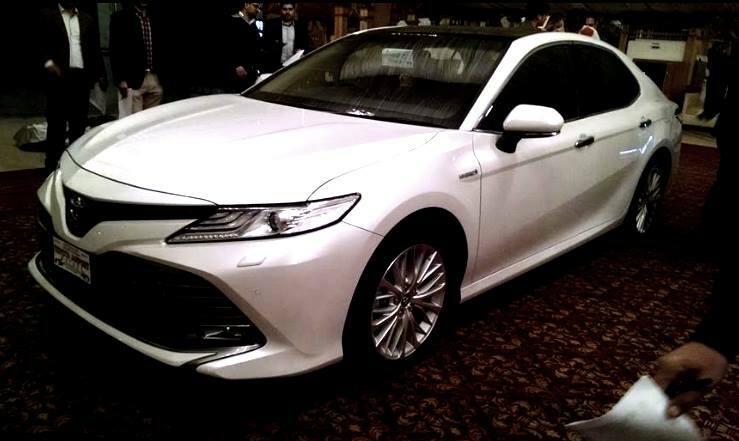 The front bumper has a massive front grill, and you can see the bumper arches just coming from extreme left and right of the bottom of the bumper and converging right under the bulge that houses Toyota monogram on the top of the bumper. 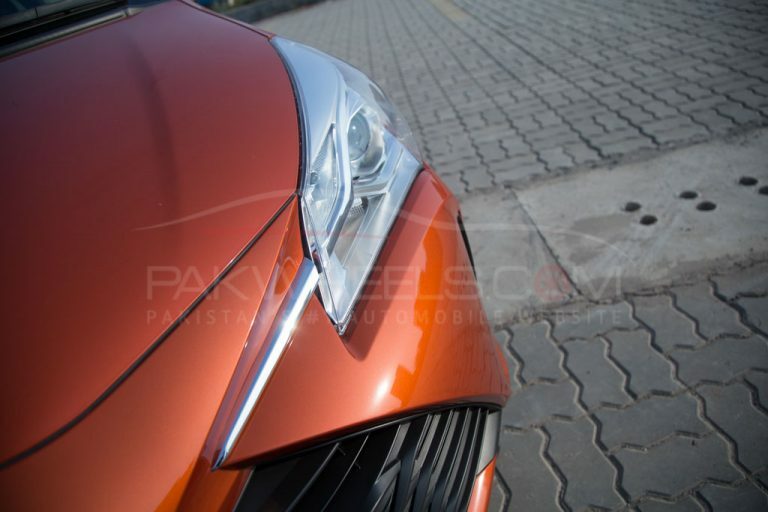 You get massive trapezoid front headlights as well. 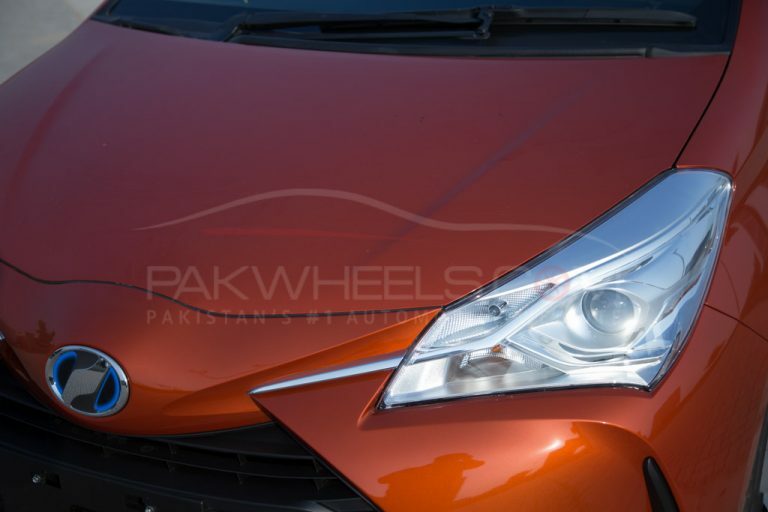 On the extreme left and right of the front bumper, you have black accents were top of the line Toyota Vitz has fog lamps. 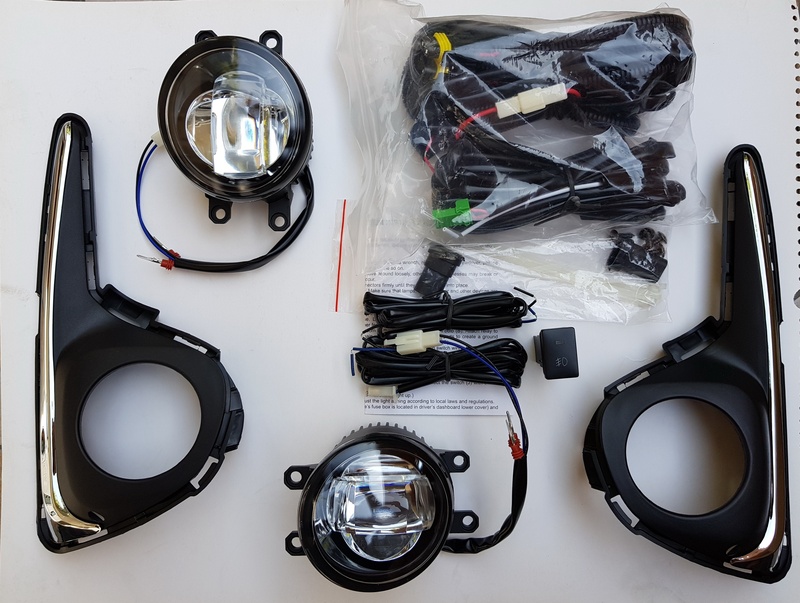 There is a beautiful touch of design where there is a simple horizontal strip of chrome accent on the bumper that matches with the headlight in the front and makes a two-prong fork in the projector type halogen headlight. Moving to the side of the car you get familiar cuts and curves. 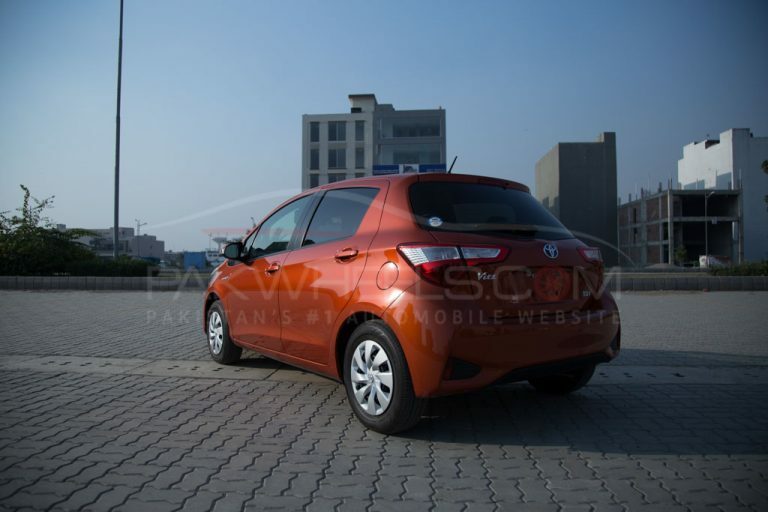 It looks exactly like the pre-facelift 3rd gen Vitz from the sides. There is a Hybrid monogram on the front fenders as well. The side mirrors come with turn signals. The fuel tank opening is on the left side of the car. 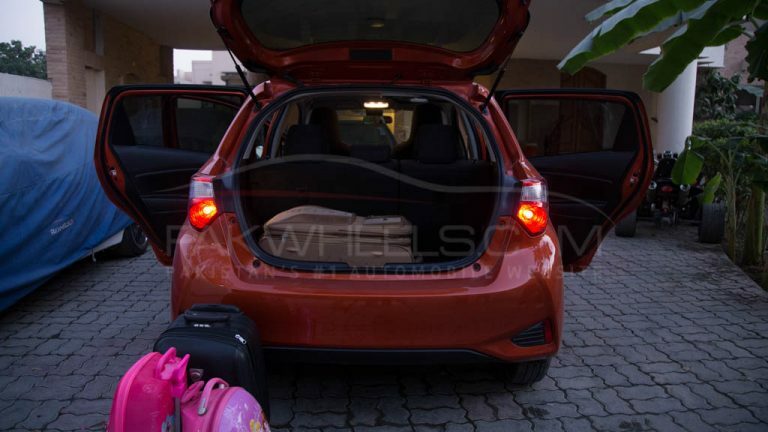 At the back of the 2017 Vitz, you get completely redesigned rear lights as well as the boot and the rear bumper. 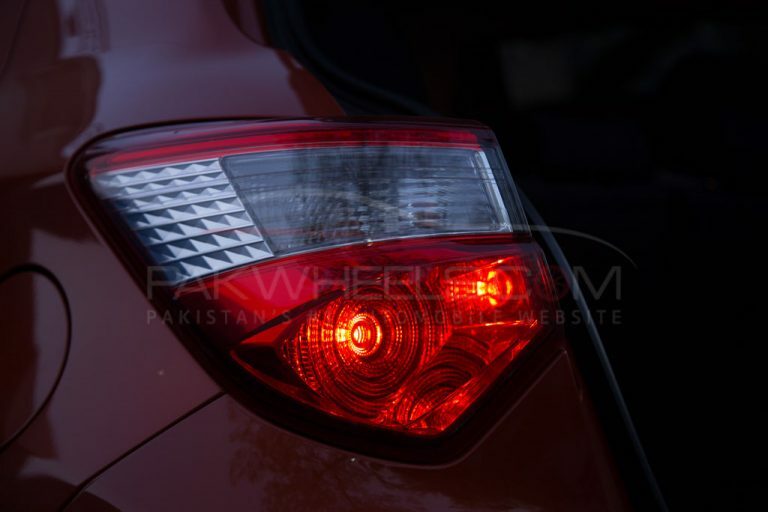 Where initially the third generation which had simple triangular brake lights the design has completely changed for the 2017 model. Now the rear brake lamps are wide and extend to the boot lid. 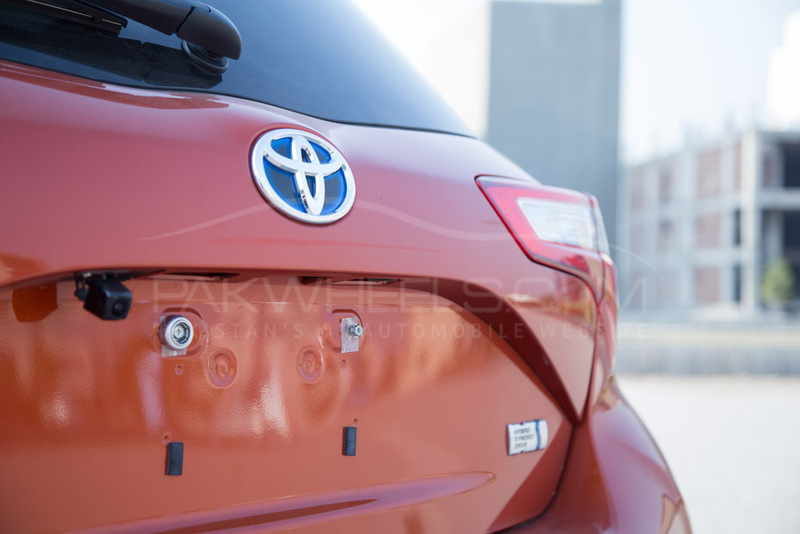 Toyota has also played with the red reflectors on the bottom of the rear bumpers. There weren’t available in the first facelift but are back for the 2017 facelift. 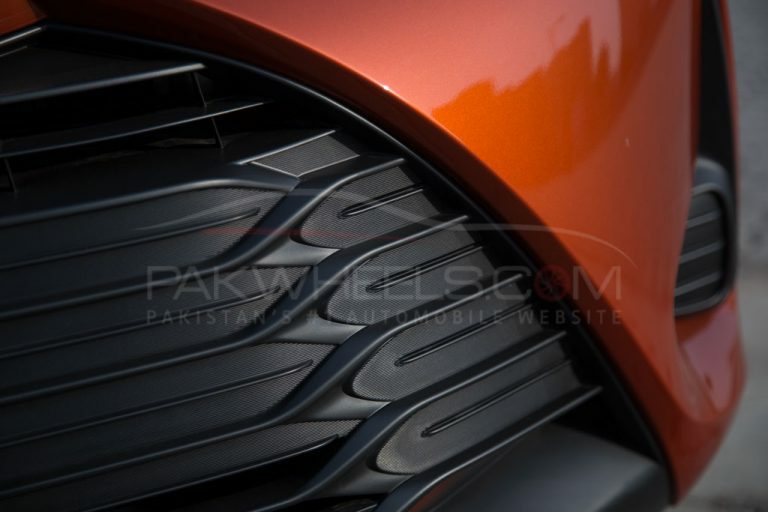 You will also notice how the rear arch-type design originates right from the extreme sides of the rear bumper and make a bow like impression on the whole rear of the car; something similar to what Toyota has done at the front of the car. The reversing cam is situated under a crease of that impression in the boot lid, where you also mount your rear registration plate. Where the top of the line 2017 let’s get a spoiler with a rear mounted brake lamp, this basic model doesn’t come with any sort of spoiler. 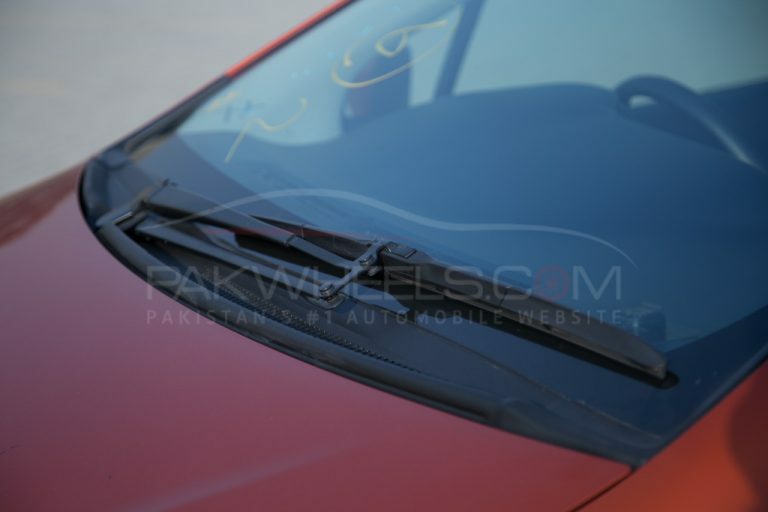 And you get a rear windscreen wiper protruding out of the windscreen itself. 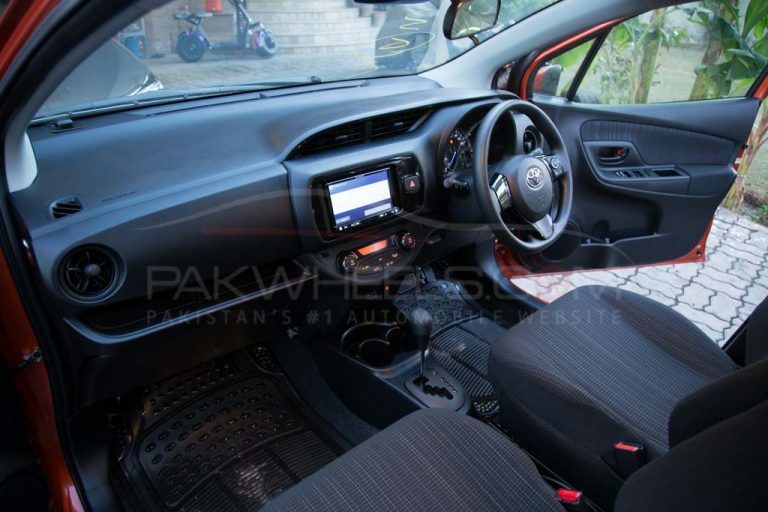 The first thing you will notice about the interior of the 2017 hatchback is that how similar it is to the interior of Toyota Aqua. The dashboard looks almost identical, and so are the door trims. It is simple in design, and not much is going on there. 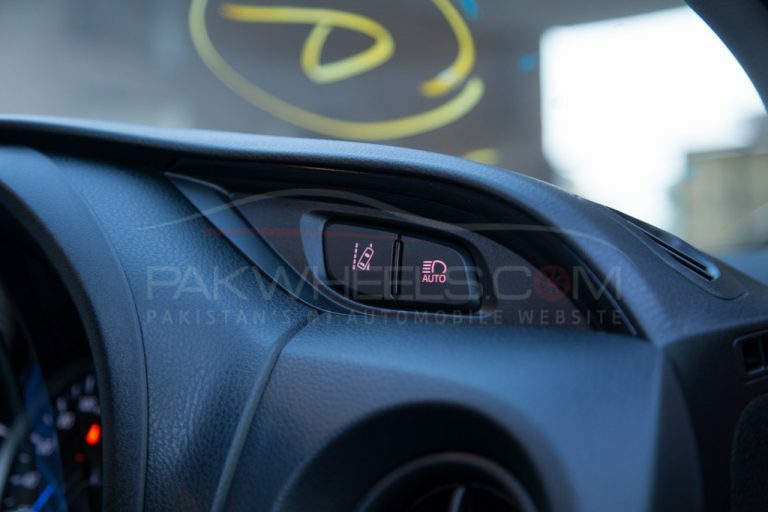 The instrument cluster is also similar to the Toyota Aqua. However, I do have a little complaint about the way the plastic and other materials of the interior of Toyota cars feel like. Some parts of the dashboard feel a bit scratchy and tacky. I had the similar impression when I test drove the Aqua. Other than the feel of the dashboard and door panels, being a new car, the Vitz 2017 has very impressive build quality. Being base model, you don’t get a push start button. Instead, you have a regular Turn Key ignition. 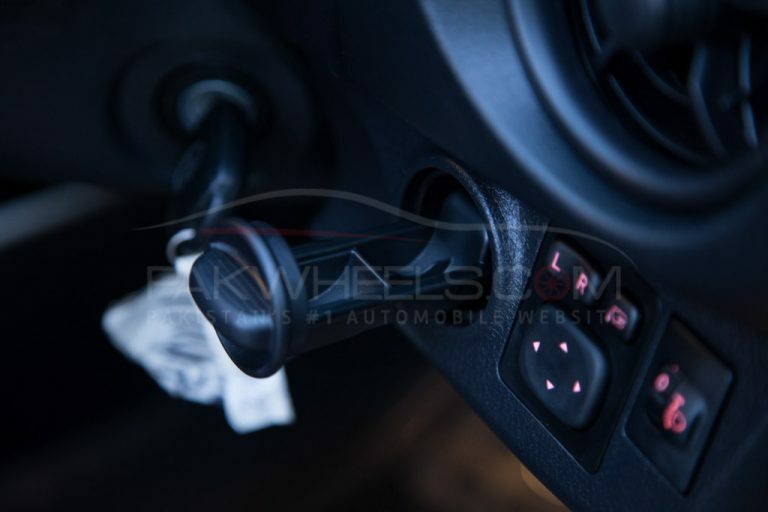 And the fact that you are turning a hybrid car with the twist of a key feels quite different than pushing a button. 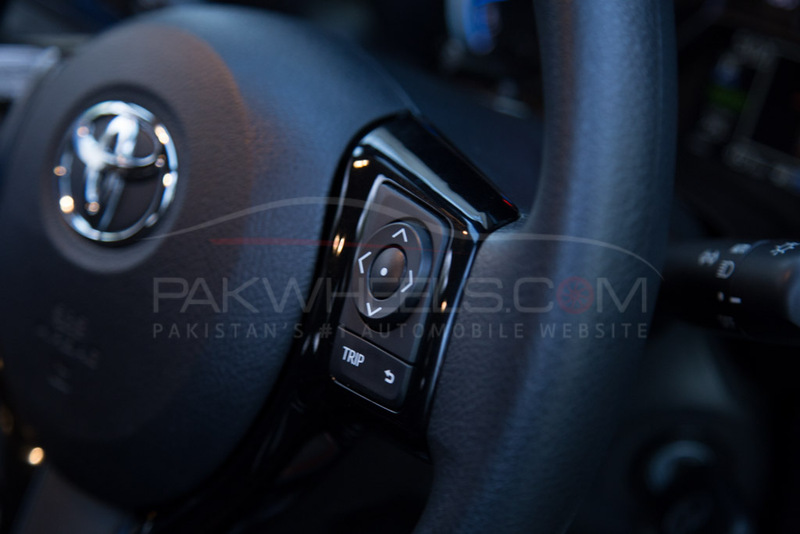 The steering wheel is quite basic and has a simple three-spoke design with multimedia controls as well as Trip and return buttons situated on the right side of the steering. The steering wheel is adjustable. On the right side of the dashboard, you get lane departure watching and auto headlight buttons right above the A/C vent. 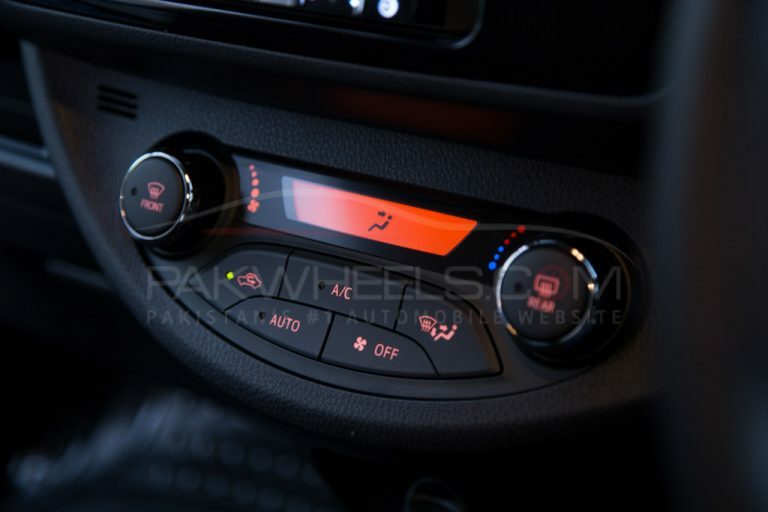 The AC vents on the extreme left and right of the dashboard are same circular ones like to get in the 2017 facelift Toyota Corolla. 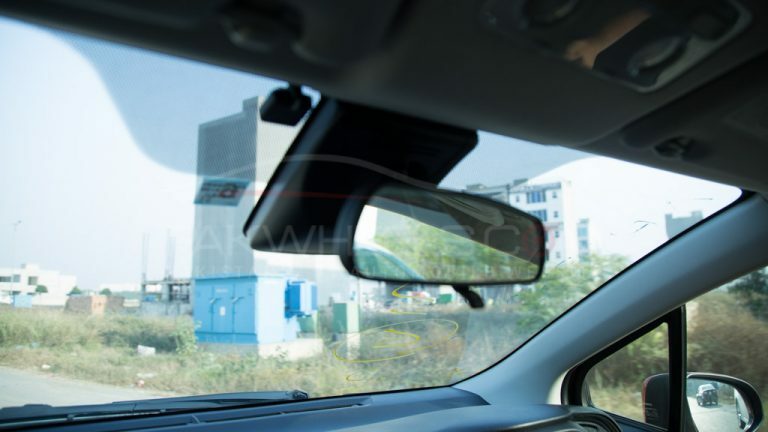 Under the right A/C vent, you have your side mirror directional controls and folding button as well as headlight adjustor rotary switch along with a small coin tray that you can push in or pull out the dashboard. 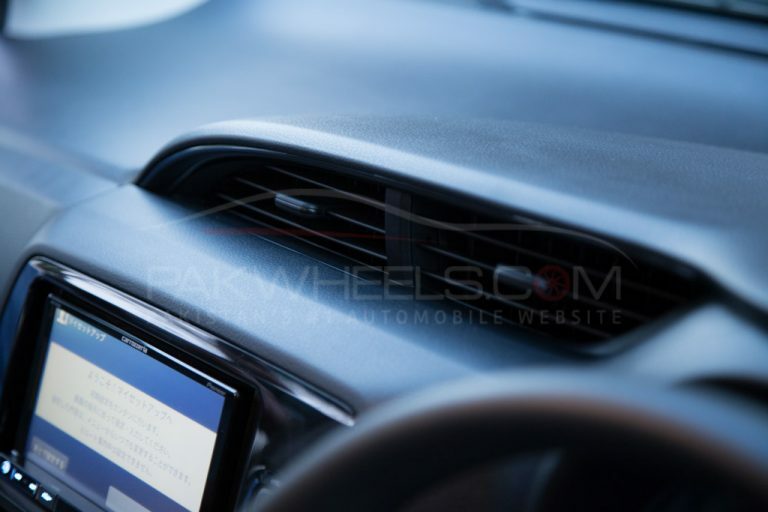 Right in the center of the dashboard, you have your Japanese head unit along with the hazards button, and under the head unit, you have your digital A/C control switches. 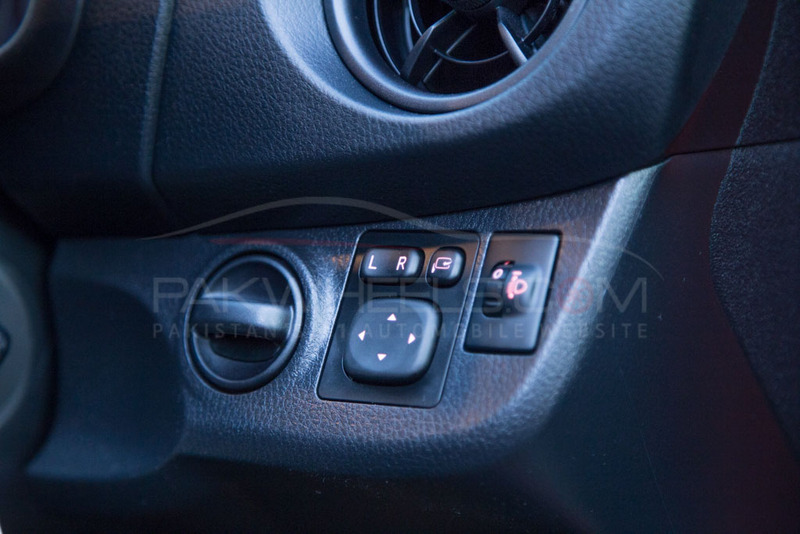 Right above the head unit, you have your Central A/C vents. 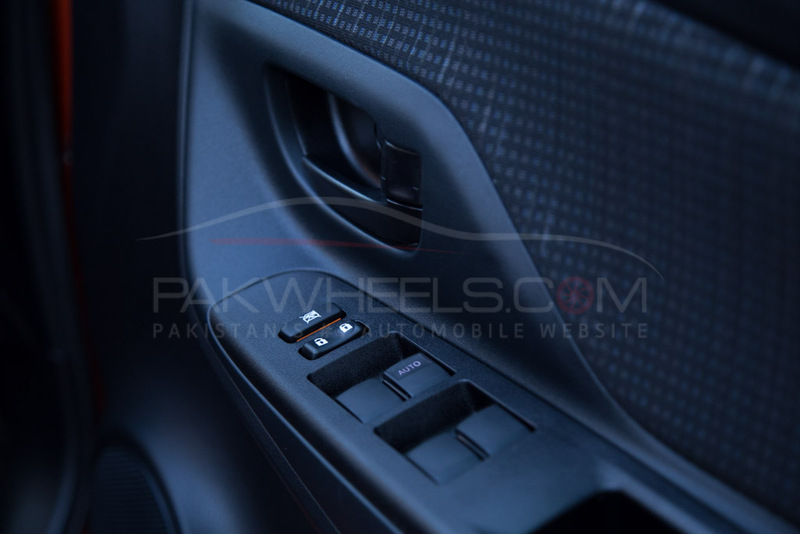 On the driver side door panel, you have your door lock-unlock switch as well as power buttons for all four windows where driver side window button is auto. 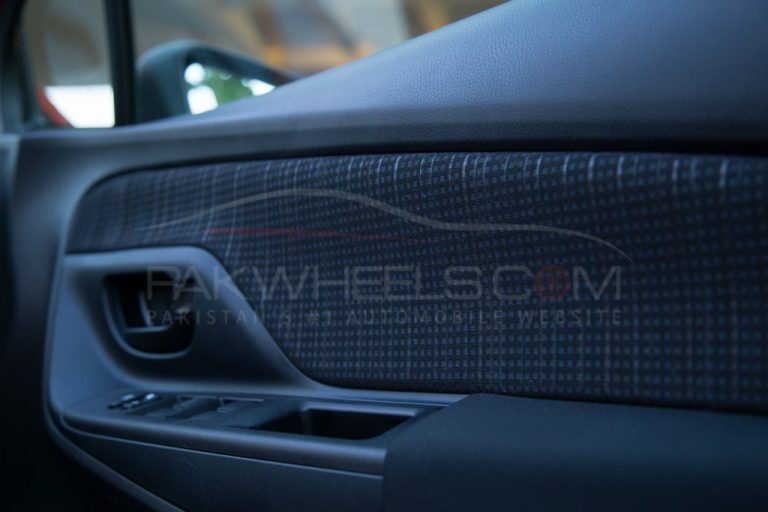 The upholstery on the doors had a nice and simple checkered design which suits the overall color scheme and design of the interior of the car. 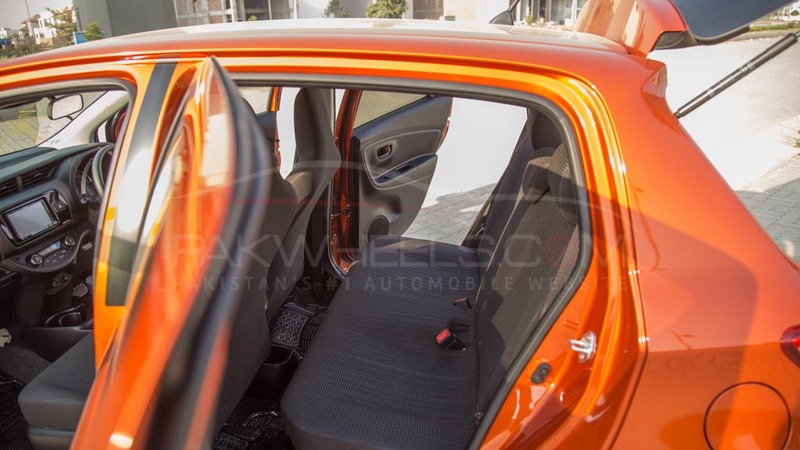 Like any Toyota vehicle, you get a bunch of storage spaces throughout the interior of the car from pockets in the door panels to small storage spaces in the center console as well as under the dashboard. 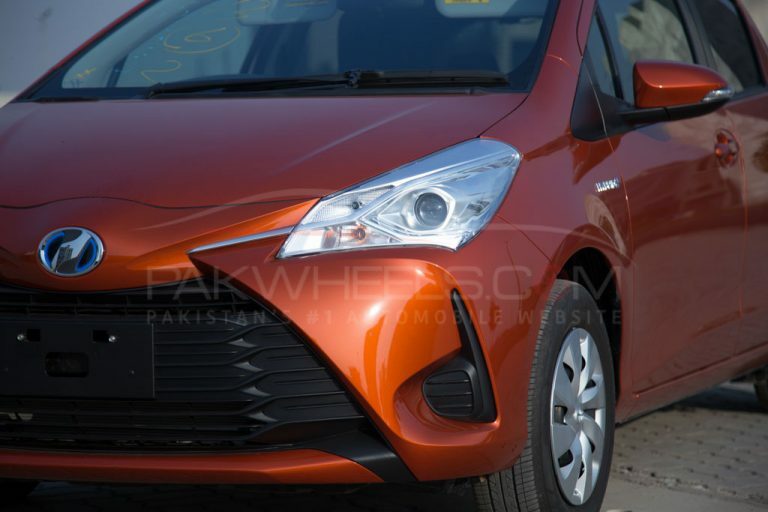 I said before the cluster panel of the 2017 Toyota Vitz hybrid looks kind of similar to Aqua’s basic design-wise. In the center, you have an analog speedometer. On the right side of that speedometer, you have a digital TFT screen which shows simple information like time, gear indicator, ajar door indication, fuel level, trip meter, temperature and few other things. On the left side of the speedometer, you have your drivetrain mode meter. The meter shows what kind of driving you are doing. 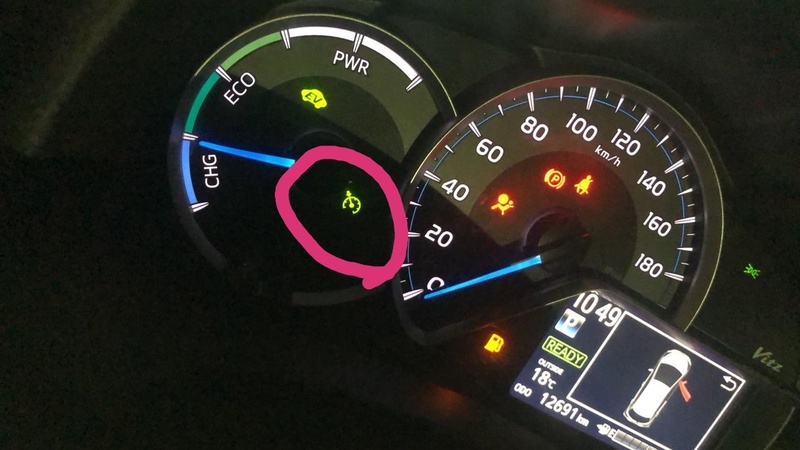 It shows if the car is charging or if you are driving it lightly in Eco mode or if you are gunning it and are using all the power available by the car by both the batteries and the combustion engine. 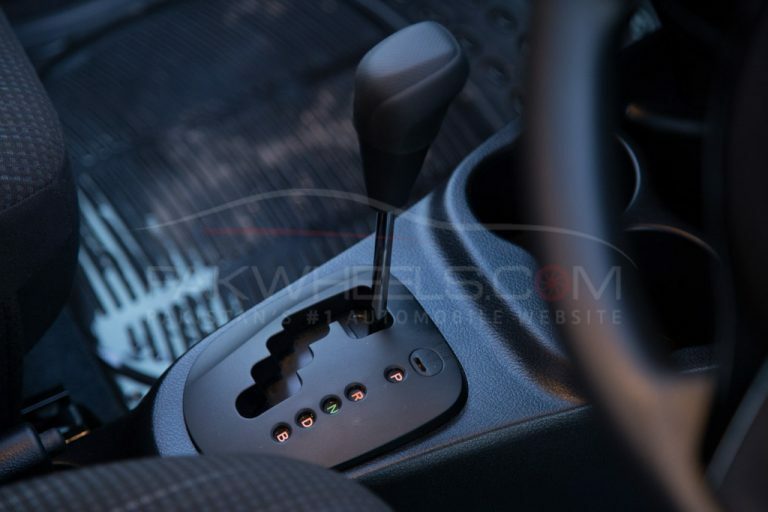 The gear lever is a simple Toyota gate type shift. 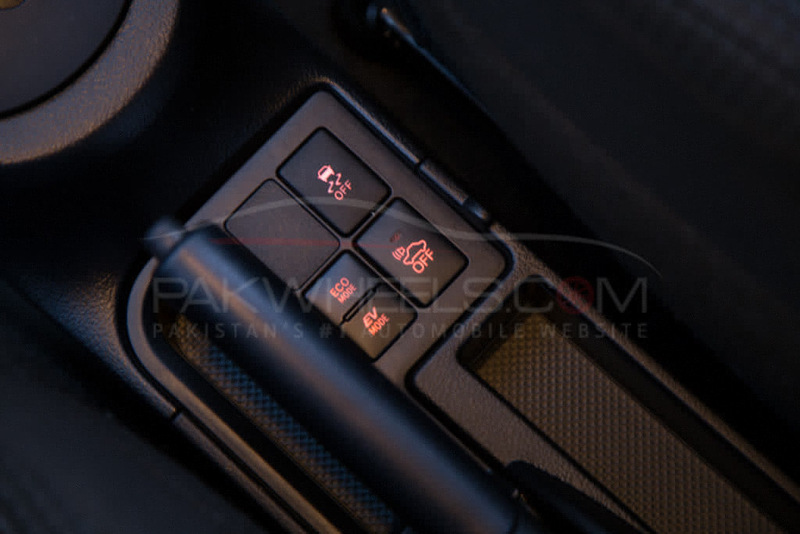 A few interesting buttons that you will find next to the handbrake are the Eco mode button, the EV mode button, the traction control, and the radar/anti-collision button. Toyota has also increased the boot from 272 liters to 286 liters. And you can push the 60:40 split backrests of the rear seat forward in case you want more space in the rear. You get pockets in the doors, on the backs of both front seats, and the center console. You also get two cupholders in the center console right in front of the gear lever. Simply put, this Vitz hybrid is pretty much fun to drive. If you think the Aqua is quick, drive this car. Being smaller but having the same 2nd generation 1.5-liter 4-cylinder DOHC internal combustion engine and electric motor makes it zippy and fun. The 1NZ-FXE internal combustion engine produces 73 horsepower, and 111 Nm of torque and the electric motor makes around 60 HP. The ICE in Vitz Hybrid and Aqua is an updated version of the previous 1NZ-FXE that was used in the 2nd generation Toyota Prius. The car just comes alive when you give it some gas. The initial zero to 60 km/h is pretty impressive, but then you will feel car struggling a bit to achieve high speeds. Although like Aqua, you get that what I call a rubberband effect in Vitz as well. It is what when you push the accelerator to the floor, and for a couple of moments you feel like nothing is happening, and then there is a sudden surge of power and car just shoots you forward like a rubber band would. This is quite common in vehicles equipped with CVT gearboxes. That effect felt less in this Vitz compared to Aqua/Prius. The Toyota Vitz hybrid 2017 comes with new E-CVT gearbox (Electric-Continuously Variable Transmission), and the better response of the car is due to the new gearbox. The Vitz hybrid felt bit quicker to respond to the throttle input compared to Aqua. Also, it might be something to do with the overall mass and weight of the car as well. Bigger/bulkier the vehicle, more noticeable the effect. 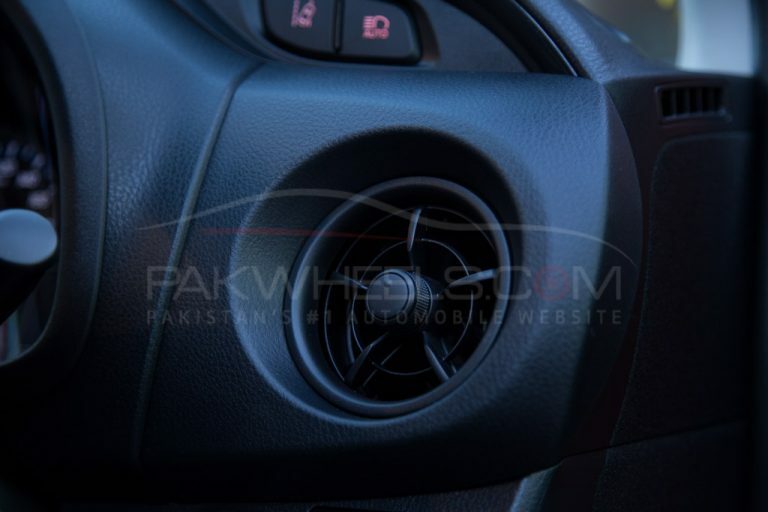 When ECO button pressed, your car favors fuel economy over everything. Your race pedal response is turned down, the A/C also slows down, and the car management system optimizes it for the best fuel economy. With EV button on at low speeds, the car will switch the internal combustion engine (ICE) completely off, and the car only drives on the electric motor. You turn the normal mode on when neither the ECO nor EV buttons are pressed. This is when Vitz hybrid makes the most power. The company claims 2017 Toyota Vitz hybrid can do as much as 34.4 km/l in JC-08 mode, but that is not possible in real-world situations. During the time I was testing the car, the car was showing 21 to 23 kilometers in a liter within the city. Having a 36L tank as well as the hybrid system means you can travel some pretty decent amount of distance in the new Vitz hybrid. 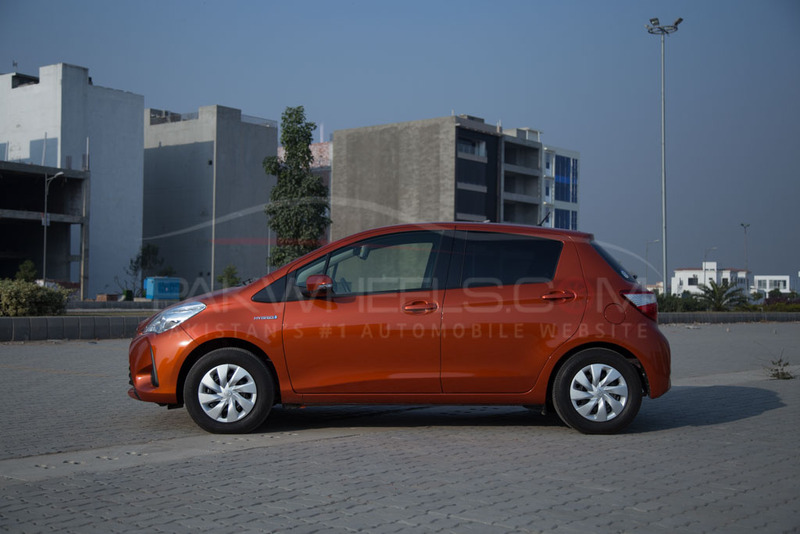 Toyota Hybrid vehicles like Prius or Aqua have what is known as series hybrid drivetrain compared to parallel hybrid in Honda vehicles like Fit. 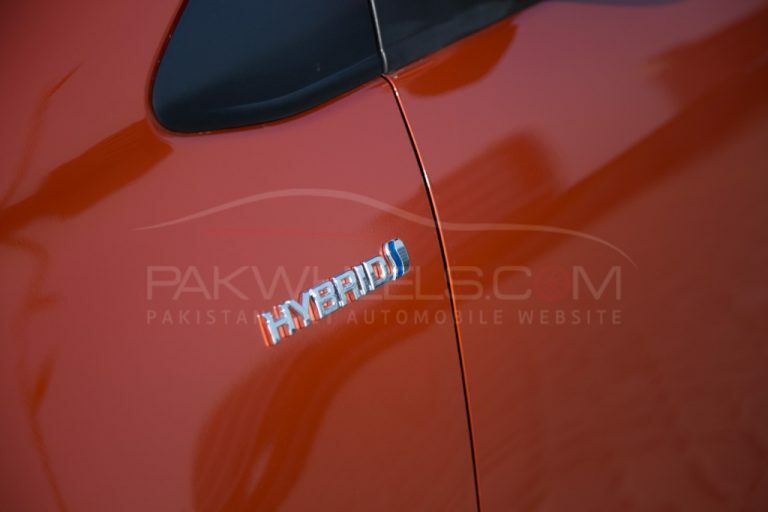 In a series hybrid, you get engine mated to a gearbox and an electric motor mounted to the gearbox. New imported Toyota vehicles have some seriously impressive AC units. Since it was cold outside (tested it in December), judging the performance of AC was futile in these conditions. It was going to perform well anyway. But these new cars have what is known as electrically driven compressors. The good thing about the AC was that I could run it on battery power. No need to keep the engine running. I have always liked the brakes of Vitz, and this hatchback is no different. But being a hybrid and having that regenerative braking, you will notice the hybrid Vitz behaving differently than the regular Vitz. In regenerative braking, you feel like your car is being pulled backward when you lift the race pedal. A hybrid car doesn’t coast as a non-hybrid car would. 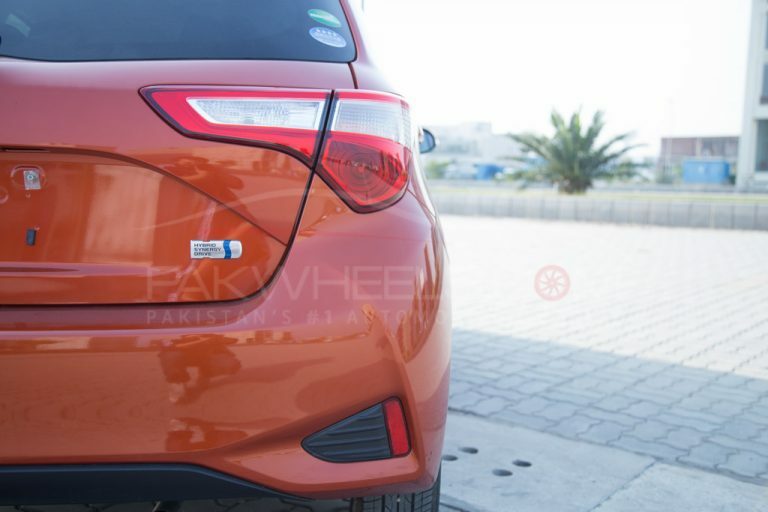 2017 Vitz has ventilated disks in the front and drums in the rear. But don’t let those drums fool you. The brakes on it perform great and are very impressive. 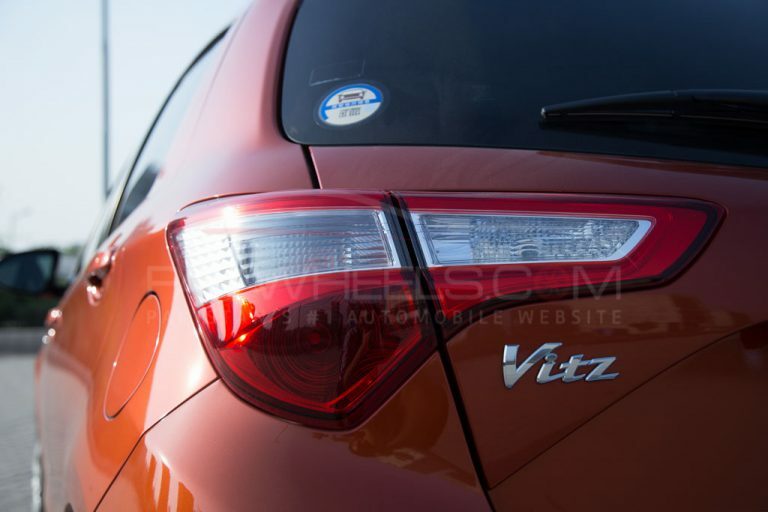 Since Vitz has a bit more weight because of all the hybrid system as well as the batteries you will notice how it will drive slightly differently than the normal vehicles of the same size whether it be and non-hybrid Vitz or Suzuki Swift/Cultus. While driving you will feel the 2017 Vitz hybrid has more mass and weight to it. Although the car is quick because of the powerful engine and electric motor you will feel that it carries more mass. Compared to the second generation Vitz that basically looks like a giant egg, the third generation Vitz although longer and is same in the width, it is a few millimeter shorter in height. Having a low center of gravity means the car handles better than the previous generation Vitz. 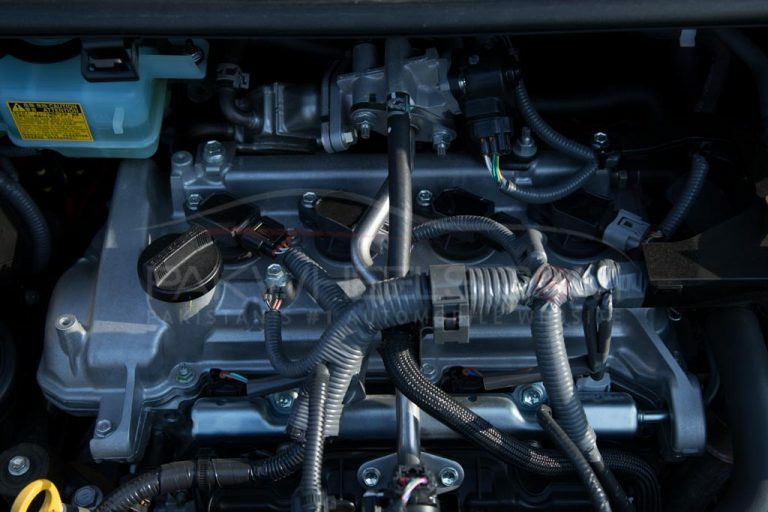 The car has a normal electrical power steering so you can expect it to be numb. There isn’t much feel to it like Toyota Aqua. The car handles pretty nicely. It doesn’t wobble or have any issues if you change direction rather quickly. The steering as I said before might feel numb, but the car will point towards the direction you turn the steering to. Also, it is not as bumpy as it used to be in its previous generation. Having a short wheelbase meant the second generation would continuously bob on uneven roads. But that is not the case in the new generation hatchback. The suspension, however, is slightly stiff considering it has to carry five people as well the extra weight of batteries. But stiff does not mean uncomfortable here. The suspension is pretty basic Toyota recipe. At the front, there is MacPherson strut whereas torsion beam in the rear. The basic F model Vitz comes with standard 14-inch steel wheels with wheel caps and 175/70R14 tires. And there is no spare wheel since there is battery pack where spare wheel usually is in the boot. Vitz hybrid comes with a puncture repair kit and an air compressor. Just like any other Japanese car the ground clearance is kind of low at 140mm. The turning radius of 2017 Vitz is 4.7 m; more than the 2nd gen Vitz (4.4m). Having longer wheelbase means roomier interior. The 2nd gen Vitz has a pretty decent room. The new Vitz is better than the previous generation. It can easily house five normal size adults, but it might get tiring on longer journies. Even with front seats moved fully backward, you have decent legroom in the rear. 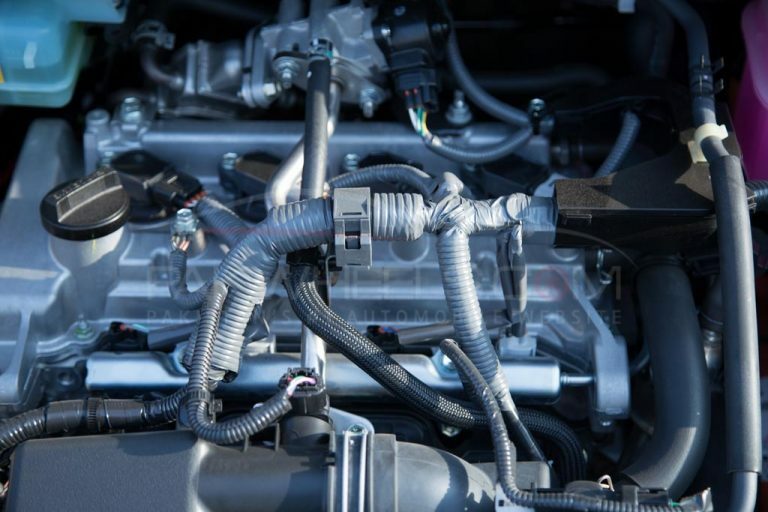 Being a new car, you can be sure that it is made with all the latest safety tech including the architecture of the car. You get crumple zones both in the front and the rear. Seatbelts, as expected, are there. Since it is a basic F variant Vitz, you get only two airbags (driver+front passenger). 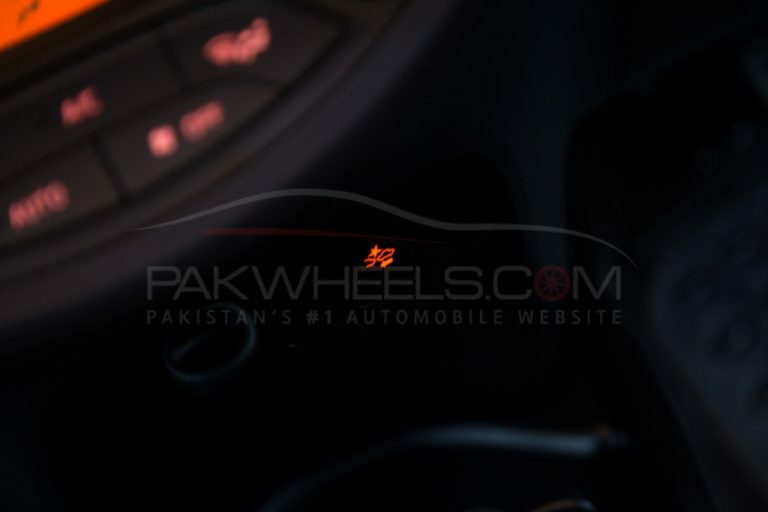 Car is equipped with anti-lock braking system as well as traction control and lane departure warning. So the question is whether you should buy one of these hybrid Vitz hatchbacks or not. In one word, I would say no. 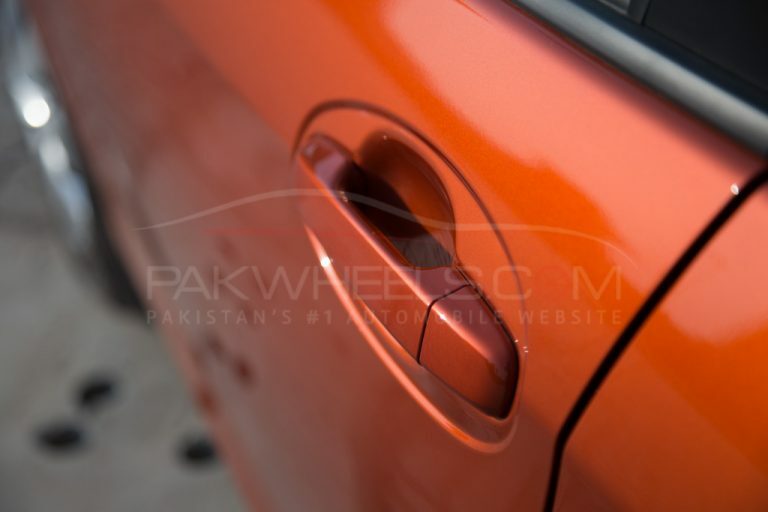 This particular car got sold for 2.2 million PKR. That is a lot of money by any measure. 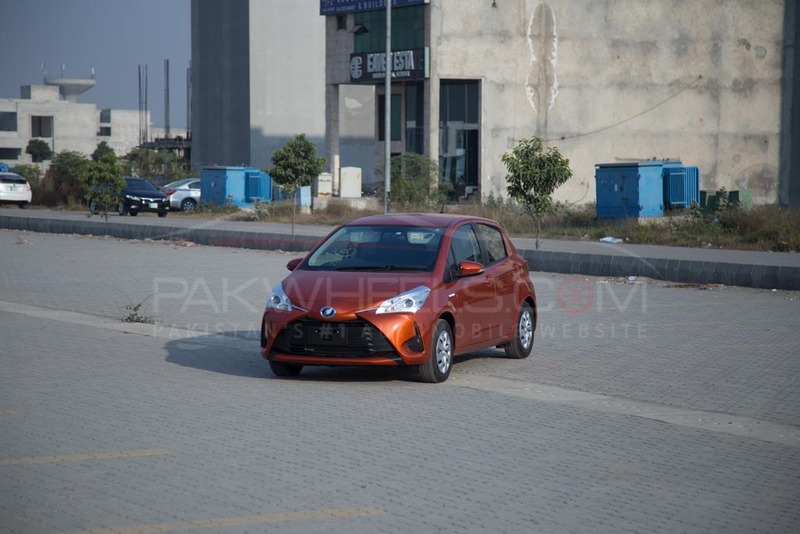 You are spending PKR 2.2 million on a hatchback. I personally cannot justify spending that much money on this car even though it was practically brand new (just 300 kilometers driven). Toyota Japan is discontinuing the Aqua vehicles. Maybe because Toyota doesn’t need Aqua anymore. 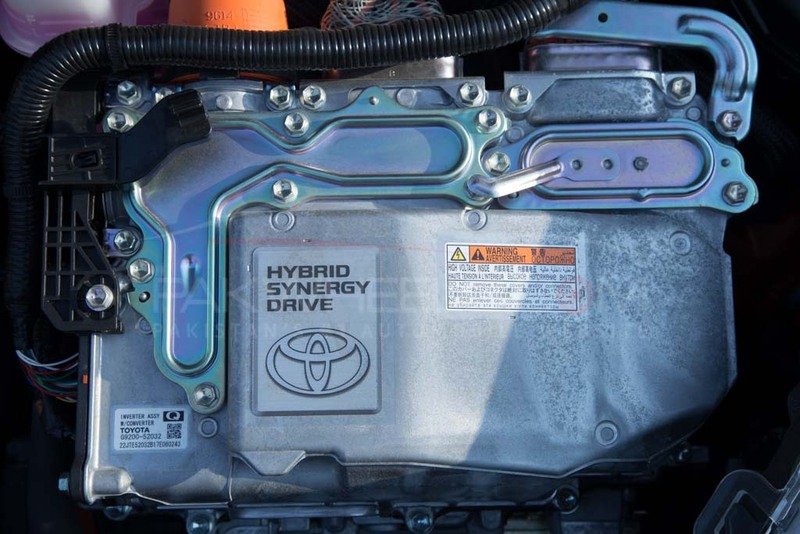 My theory is that as long the hybrid synergy system was manageable size-wise, Toyota sold it in 2nd gen Prius. With time, Toyota managed to make it small enough for a smaller car and Aqua was born. And now since the same system is small enough for something like Vitz, there is no need to make just Aqua for it. Aqua only came in hybrid trim and that’s all. 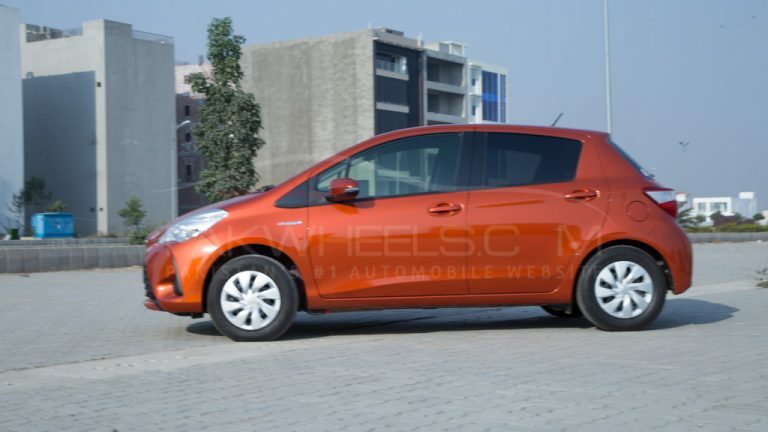 Whereas the Vitz is available in a plethora of options already. 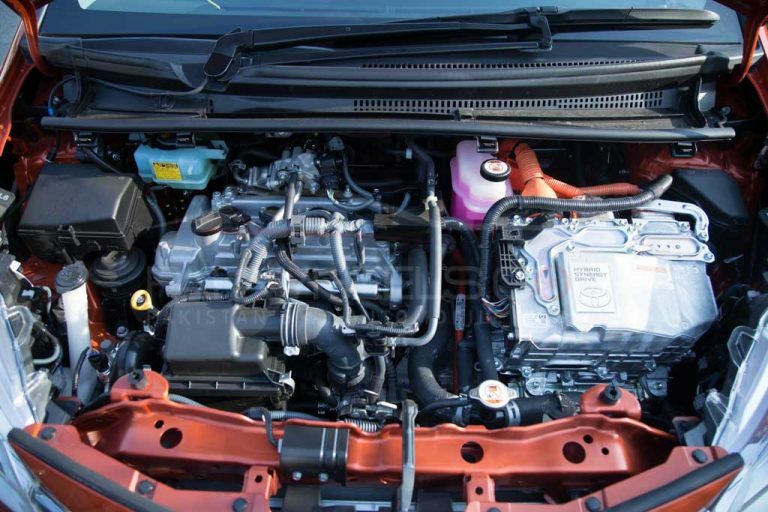 Whether its engine options or transmission options or platform options, Vitz caters everyone. So no need to make just one car like Aqua to put their hybrid system in. Well, this is just a theory, and I might be completely off the point. 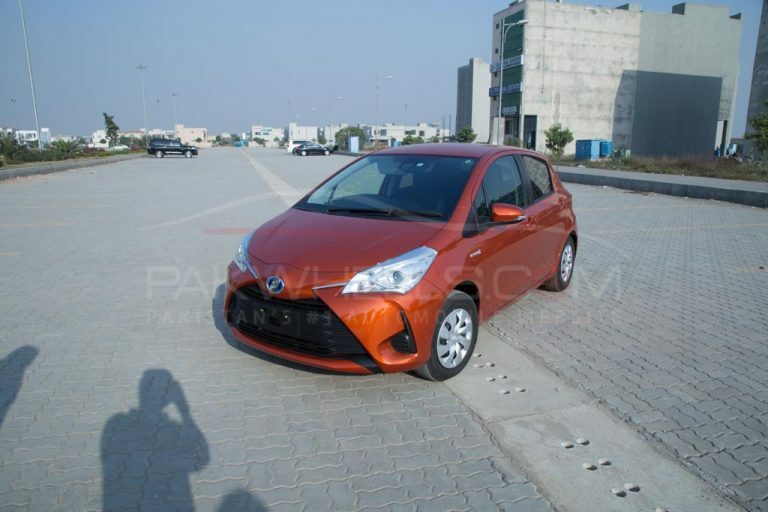 So if that is your motivation, that you are after something like Aqua than in near future this Toyota Vitz Hybrid is going to be the only option available. But right now it has a unicorn status and its practically brand new, hence such a high price tag. But with the passage of time, it will drop to what the 2013-15 Toyota Aqua is priced at. So maybe wait a couple of years and in the meanwhile, buy something else instead. Until next time, happy motoring! You can browse through the full photo gallery below.